This photograph shows part of a building - a bar - in Stalybridge in Tameside in Greater Manchester. It caught the eye. Well, it would, wouldn’t it: there can be few shorthand expressions that capture so much with so little. The building is (was?) Bar Max, which is at 9 to 11 Market Street, so the use of this in/famous expression is not without some justification, but you can’t help but wonder if it would be so prominent if it was 85-87 Market Street or something. 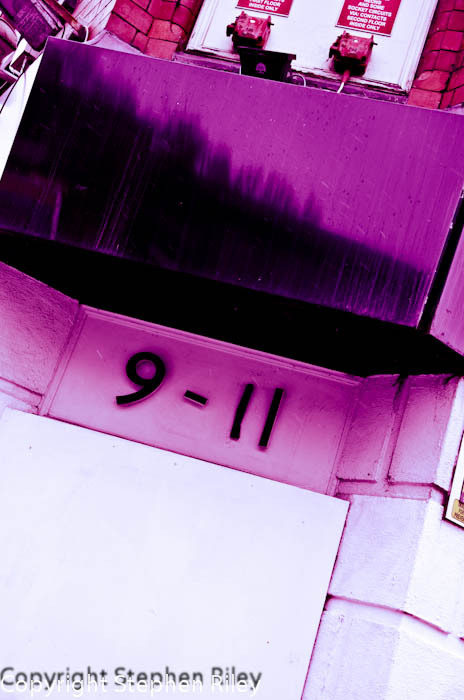 On closer inspection, one of the ‘ones’ in ‘eleven’ is misshapen and in fact repaired and held together with what looks like black insulating tape, giving a sense of a kind of crude inelegance and of a keen desire to make sure that 9-11 remains visible, even if it means working quickly to maintain the message. Maybe the fact is that we are hyper-sensitised to this pair of numbers and nothing was meant, but it seems deliberate, rather unnecessary and looks very much like the highlighting of these figures is cashing-in on that associated horror and tragedy.